When you are starting a business, there could be expectations from you to do all necessary and important office tasks by using your small desk. Since the expertise expands, the scale of tasks as well as the number which is needed to keep the business going will increase fast. Hiring good employees could be a simple and easy solution to your problem. But if you want to be more effective, then we would definitely suggest an office automation system. What is Office Automation System? Office automation systems uses both hardware as well as software solutions that will ease your workload. It is so effective and simple that it may activate options inside the software which you already have but don’t cost much. An office automated systems examples can be used to explain this. In your mail, you will find a filter which will help you sort out all messages that are incoming into folders that are appropriate or even could send them to other staffs that doesn’t even respond. The automation system may also demand technology that is expensive and in demand. For example, you might have to lease or even buy a machine that will automatically scan the printed manual, duplicate and collate the pages, binds all documents with the help of a hard cover and stacks in for a proper and easy distribution. This is enough to explain the definition of office automation system. 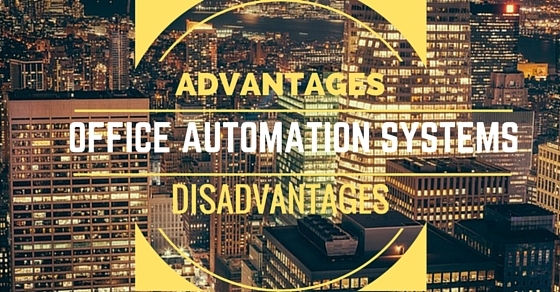 Here are some of the basic and most attractive features that fall under the category of office automation system. Keep reading to find out! Installing an office automation system will definitely reduce the work load. It will help you handle load easily and allow you to enjoy yourself at work. Those who have installed office automation systems have only praised its benefits. It is known for lessening the work load burden and ensures you are able to work at office in peace. There are several kinds of customs which are needed to perform in every firm. The thing with office automation system is that it can handle this custom of the firm in an easy manner. In fact, it makes multi tasking much simpler and easy. From being able to open the entrance gate to controlling temperatures inside offices, it will look after the processing steps along with the data and entries along with a good amount of work load which will be handled by the system itself. Feasibility always means being able to make practical decisions. Any work which doesn’t have feasibility will remain in doubt. Office automation systems will always analyze the conformation of work in every office. From time to time, you need to check the input as well as the output which makes work much more acceptable so that managers are able to evaluate. Getting good results or working on tasks can only happen when the results are feasible. Apart from that, taking proper decisions could really help the managers handle a proper run among all competitors. Feasibility of work is something which is needed to proceed and must be ensured within the system. Every system should be capable of making the workforce work on things that are given to them. That is how it will be able to confirm the sustainability and at the same time adapt themselves to the environment of the office. In case the system is not all that popular and manageable, you might end up seeing a crushing failure of the office’s lifestyle altogether. The failure of office automation systems will deteriorate the harmony as well as the order of these tasks and lead to drawbacks. Competitive advantages are always considered as the plus point in every firm. A firm may only begin to imagine handling and reigning over others only when it is able to increase the competitive advantages in other places. The positivity of office automation systems will always boost competitive advantage over the other firms which is not even needed. It will keep adding to the prosperity of even more firms and get a much bigger assurance when it comes to surviving in a market that is so competitive. Storage of data means saving all confidential and important documents and records related to office. The office automation system also consists of handling data applications that are used for handling and creating documents, images, spreadsheets and files. Several kinds of word processing as well as desktop presentation packages are present which will allow in creating or even editing any data. At the same time, you can also find a few dedicated applications which are needed for images as well as spreadsheets. Data management happens to be one of the best and biggest advantages that comes with office automation systems. It offers several facilities such as managing of data and information that is sorted. Big business organizations are able to monitor and even handle projects and activities that are big inside the office by using an electronic management system. The program schedulers, tickler systems as well as the reminder systems happen to be some of the main features that will boost and empower your business and help you finish work without hassle. Exchanging data that is stored or even manipulated happens to be quite an essential component of the office automation system. It will help in sending files, exchanging any information or data and use the method of electronic transfer application whenever the need arises. Throughout the network connection, all information as well as data which includes presentations, text documents and spreadsheets could be send within a couple of seconds only. By illustrating the nature of these office automation systems, it will allow the employees to handle real time and boost the productivity at the same time. The office automation system also guarantees more efficiency than any other machine. Once all bugs have been removed from the program or the application, it could help you get more accuracy in your daily businesses. The programs used in this are far more effective and reliable and people who have made this in real. It also implements an advanced business automation software which also reduces any signs of errors. The office automation system will empower all businesses to all time and money both. It will simplify all the complex tasks, help in getting a more dedicated and proper resource and will also lead to a much bigger amount with time. An example can be used to explain this. When you introduce much bigger and better computer technologies along with communications, businesses nowadays have been restricted to any geographical limitations. It can help in saving both money and time and the costs that people usually spend on traveling. The digital storage is also an essential feature that will reduce the need of preserving all hard copies. Since most business processes have now been automated, you don’t have to invest that much on hiring any new resources or even taking care of any of these tasks which can be executed easily by using the system of office automation. Like we all know, time saved is equal to money saved and the business enterprise could also save a lot by automating several business processes. By saving the entire expenditure as well as investment on other resources, the profit margins shall definitely see an improvement. Office automation systems are quite expensive when you first begin to invest in the office automation software as well as equipment. A professional office suite or machine which can do so many things such as scanning, binding documents and duplicating them has to cost you some money. Employers who have worked for years might not use this function. They are aware of the old and manual methods which are difficult to adjust. This may also need some training that is time consuming. In any case, if the automation system doesn’t function all that well, power will be interrupted. You will not be able to find any manual method on a regular basis and that could add more to the disadvantage. When you are implementing any office automation, you don’t have to begin by buying the software or equipment and then try to match it with your business. You should focus on the tasks you would like to automate. After that, search for the budget inside the systems that can perform and work very easily. Most importantly, you should consider a lease or even a rental instead of a purchase. It will help you to try out the office automation system in a temporary manner without any hassle. It should help you understand office automations as well. Before we end the article, here are five things we believe you must know about office automation systems. When you are choosing an automated office systems for your office, you should first take a quick look before purchasing. See if it suits your needs, check whether it can create those processes just like you want etc. A good automation system should not only just determine and check operations and their flow but also make sure your system is working properly. You should always search for those systems that will design the flow of work just like it would do inside your office. With office automation systems, you get one benefit that you will not find anywhere. You will surely get access privileges inside your office just like every person belonging to the organization would get. You should always look for such office automation systems that will permit in defining the access privileges with the flow of perceptions at the same time. In short, it helps in defining access controls too. Do you think it is possible to be able to finish the process without any kind of approval? There are plenty of process that one needs to go through. Therefore it is important and imperative to have a proper system of office automation that will allow you to create a much better structure and process of approval along the business operations and their lines. When you have an office automation system, you will be able to use it whenever and wherever you want. You also have the right to wait and boost the flow of such operations and even choose any office automation system that is cloud based and would allow the approver to access it from anywhere and everywhere you want. All you have to do is go cloud. The office automation system also helps with software that are used in all organizations. When you choose an office automation solution system, you will be able to integrate the software tools which are used inside these organizations. You can keep yourself safe from transferring the data from one part of the system to the other. Also you should remember to manage the office accounts, payrolls as well leaving management systems in one place. This brings the post to an end. If you have enjoyed reading the article and have found some benefit from it, do let us know in the comment box below. We would love to hear from you. Office automation systems are essential in every office. They are needed for reducing work load, raising levels and allowing people to work in a hassle free environment. If you haven’t installed one yet, we would definitely recommend you to do so. The benefits you will reap out of this are plenty.